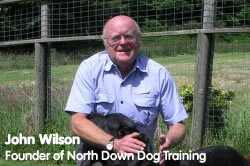 With over 20 years professional experience, John Wilson of North Down Dog Training offers a unique service focusing on one to one training of dogs so that customers get the best possible experience from the dog training. Offering an individual and no nonsence approach to training, John attracts dog owners from all over Northern Ireland, the training can be tailored to suit personal requirements. Over 70% of the clients that come to North Down Dog Training come from vet referrals or recommendations. John warns customers that there is no quick fix to some behaviour problems and you should be cautious of anyone offering such a solution. One to one training sessions are the most effective way to work with clients and their dogs, John has been training professionally since 1989 and has even trained real wolves. The company is fully insured and is a member of the British Institute of Professional Dog Trainers. We have built an attractive and informative website for the business at http://www.northdowndogtraining.com/, as well as assisting with social media platforms such as facebook, twitter and youtube, integrating these useful formats with the website. We have also built an online commerce site for the company http://www.petfoodexpresstoyou.com. This is a recent video clip of John training his dogs.